This is part of a series of posts about Storage Field Day 9. 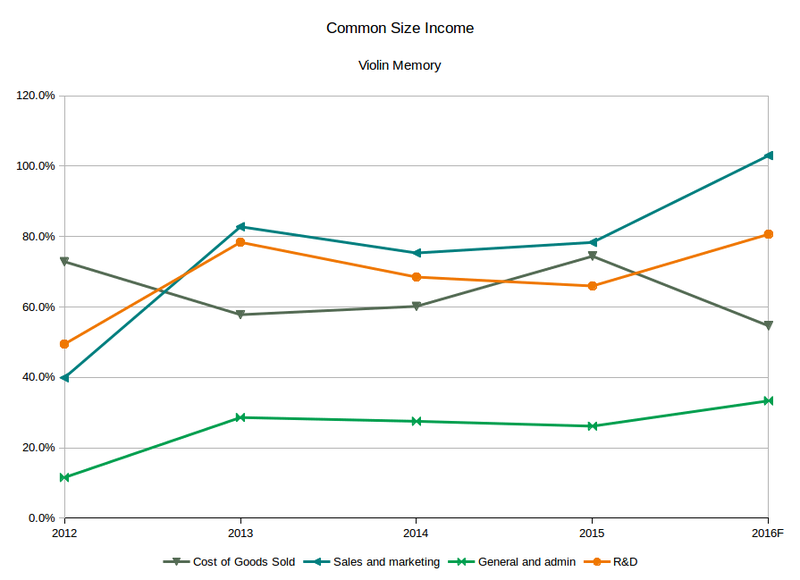 Violin Memory are another public company, so we can dig into their financials to find out what’s going on. I’ve once again estimated 2016 full year results by extrapolating from the first three quarters of the fiscal year. In this case I’ve just used the Q3 balance sheet results to approximate for what they’ll be for the full year, since it’s not far away now. Revenue flows are again a 4/3 simple extension from the previous three quarters. Once again, let’s try to sum things up with an indicative chart. This chart shows that Violin was growing sales for a couple of years, but then they weren’t, and it looks like 2016 will be another year of not growing. 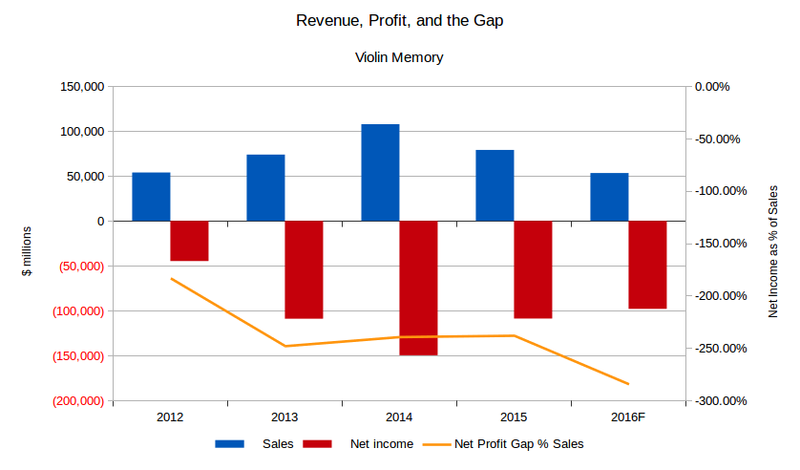 To make it worse, the gap between revenue and profit is getting wider, not narrower, meaning they’re losing more money even when they do sell more stuff. That’s the opposite of what you want. It did flatten off a bit there in 2014, but it looks like 2016 will have things get worse again. Violin just aren’t shifting enough product. What money they do make is all eaten up by Sales and Marketing and General and Admin costs, which have been over 100% of sales (so, all of it) for three years, and it looks like 2016 is going to be another one. That’s four years in a row of spending a lot of money on trying to sell stuff that people just don’t buy. There’s a bit of a good story buried in there, which is that Cost of Goods Sold in 2016 is looking like it’ll be better than it has been, well, ever, which means gross margins are up. Yay! Alas, they’re all getting spent on Sales and Marketing that isn’t working, and admin costs are way too high for the level of sales. Which would be fine, if that’s what Violin were actually intending to do. The rhetoric from management in the 10-K filings is all about product, though, and the only mention I see about software or services is buried in a note relating to the write-off of inventory. Page 57 of the 2015 10-K if you’re particularly interested. This is due to the way revenue is recognised. When customers buy support contracts, particularly long-term ones that run for several years, then the revenue is only recognised when the services are actually delivered. Violin explain this in a couple of places in their SEC filings, like page 68 for 2015 10-k.
A quick word on terminology. The accounting standards (GAAP and IFRS) define short-term as happening within the next fiscal year, so about 12 months. Long-term is anything longer than short-term. The increase in short-term deferred revenue here is happening at about the same rate the whole time. But long-term revenue isn’t. This implies to me that Violin aren’t selling as many long-term service commitments, like 3-year support contracts. People are just buying year-to-year since 2014, which is what I’d do if I was concerned that the company might not be around to give me what I paid for. 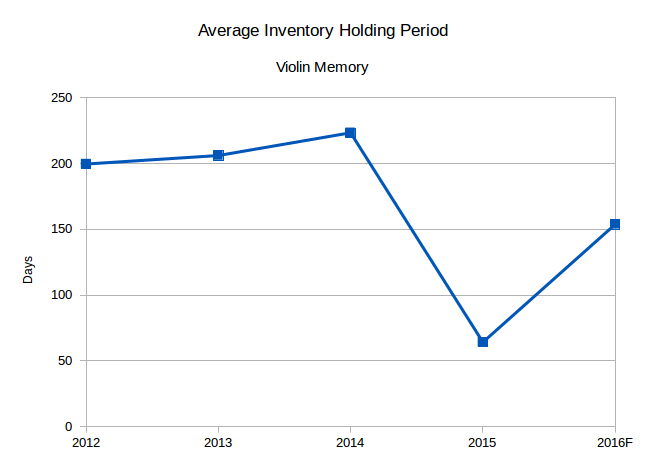 But inventory holding period looks like it’ll be back up around 150 days in 2016, meaning there’s a bunch of unsold gear sitting around for over five months, on average. 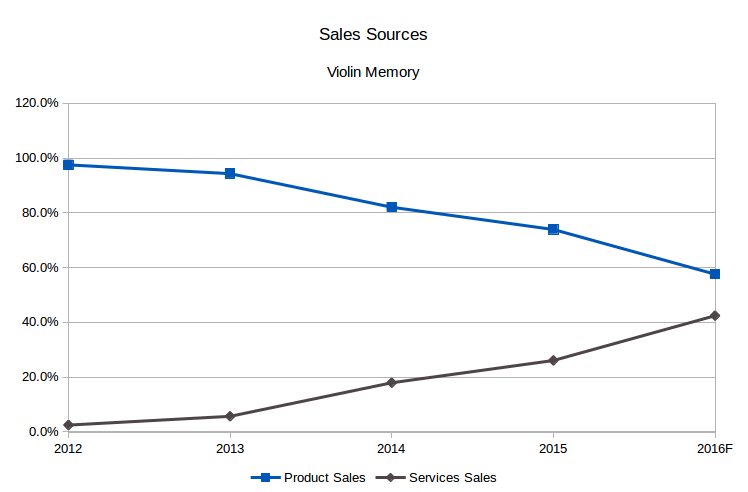 If the Flash Storage Platform isn’t a hit with customers, it’s not clear to me how many other options Violin Memory will have. When startup folks blather on about runway they mean “how long until we run out of money?” When you run out of cash, you die. Runway is how long you can go until you run out of money, based on the amount of cash you have now, and your burn rate which is how fast you’re spending money. It’s an airplane analogy, basically. If you built up enough speed (revenue growth) before the end of your runway, you take off. If not, you crash and burn. 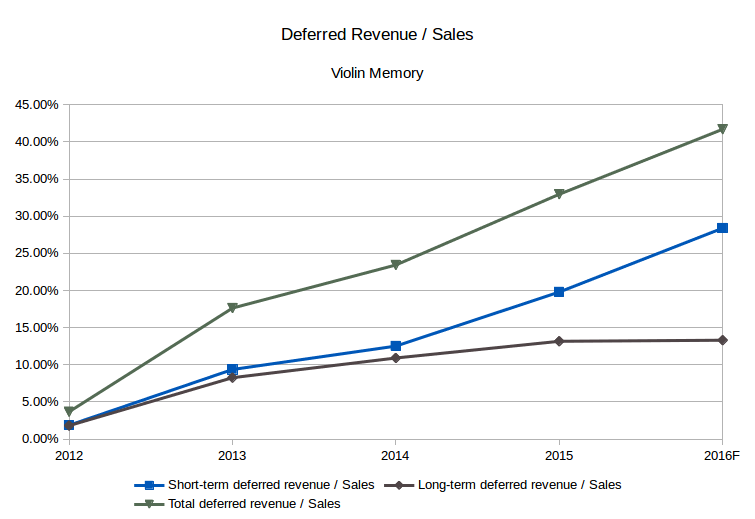 Violin’s burn rate is about $85 million a year, based on their last quarter’s 10-Q. They had about $96 million in cash and short-term investments, which are the liquid assets you can most easily use to pay for stuff. So, Violin should run out of money around the end of 2016 if they don’t find someone to give them some more. That’s not a big deal if you’re growing strongly. But if you’re not, getting more money is harder, because people are–and quite rightly–concerned they might not get their money back. It makes the money more expensive, because you either have to give them more equity, or pay a higher interest rate if it’s debt, plus all sorts of other fun conditions like liquidation preferences. I could be wrong about a bunch of things because this is a pretty hasty analysis, but my read on this is that Violin are in a lot of trouble. They need a good product that people will want to buy so they can stop spending so much money on Sales and Marketing because it’s killing them. And they don’t have much time to sort it out. I hope they show us one at SFD9. For their sake.